I'm kind of an idiot. Last year, during Canadian Thanksgiving, I took detailed notes about what we purchased, how much we made, and how many people attended. I thought this would be invaluable when calculating how much to purchase and make this year. It would have been, had I actually listened to my notes. For example: in my notes it said to only make two loaf's worth of stuffing for approximately 30 people. Last year I made four loaf's worth and ended up having twice as much as we needed. This year, against my better judgment, I made three loaves and ended up with fifty percent more than needed. On the one hand this proves that my notes from last year were spot on. Unfortunately it also proves that I'm an idiot. This year a lot of people asked us about what the meaning of Canadian Thanksgiving is. 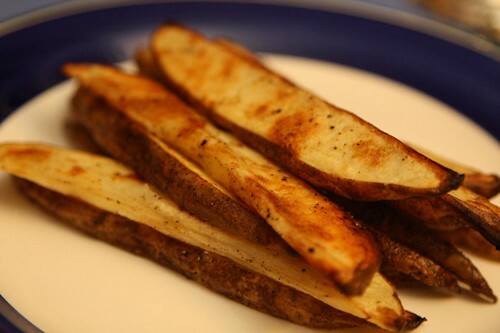 Well, I'll try to explain by showing you the dinner we prepared as used in leftover form. 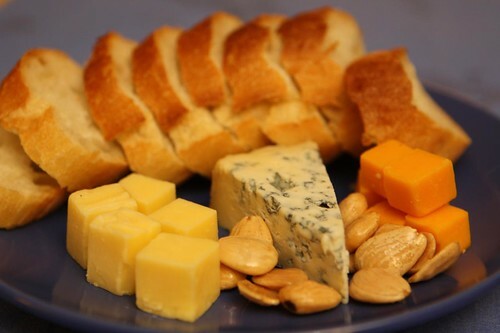 We started with a cheese plate of Jasper Hill blue, Marcona almonds, and Seaside and Darigold cheddars. For salad I served some mixed baby greens with grape tomatoes, and cornichons. 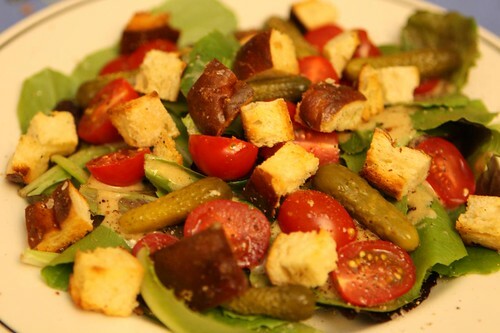 I toasted up some leftover cubed pretzel bread and made a vinaigrette with Dijon, cider vinegar, and olive oil. Jen and I made our two variations of hot turkey sandwiches, Jen's with two slices of bread, me with my open-faced approach. 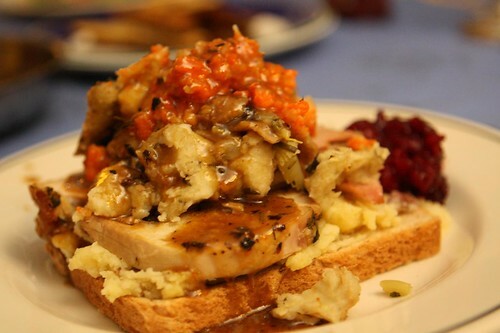 Both sandwiches contained mashed potato, mashed carrot and turnip, stuffing, roasted root vegetables, turkey, and cranberry sauce. 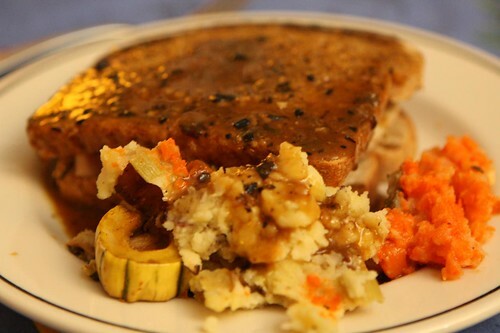 I always feel guilty about cooking a new food to accompany the hot turkey sandwiches. However, this guilt is nothing compared to the look of disgust Jen would give me if the sandwiches were not accompanied by fries, in this case: oven fries. 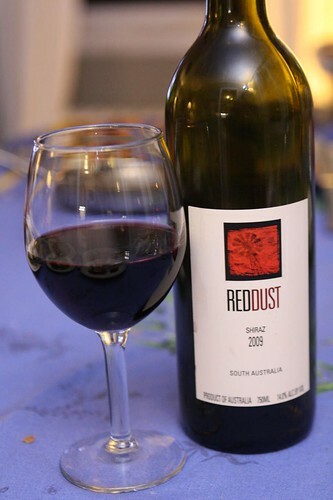 Jen had some of this shiraz from Red Dust. On the back of the label the wine talks about how "the ubiquitous red dust of the Australian outback has been adopted for Australia's most popular red wine variety, Shiraz." I'm not quite sure what that is supposed to mean. To pari with this bonanza of Canadian Thanksgiving leftovers I figured it would be a perfect time to have a pumpkin beer. Pumpkin beers have pretty much exploded in the last 5-10 years and now every brewery under the sun is offering one version or another. They range from "tastes like regular beer" to "just tastes like pumpkin pie spice in my regular beer" to "actually quite interesting with a subtle pumpkin flavor." I chose to have the Pumpkinhead from Shipyard Brewing Company. I had this on tap when I was in Portland this week but, since I didn't blog about it, it didn't really happen. The bottled version of the beer was quite good, every bit as nice as the draught version. Unlike most pumpkin beers, surprisingly, the pumpkin flavor actually came through nicely with very little spice. 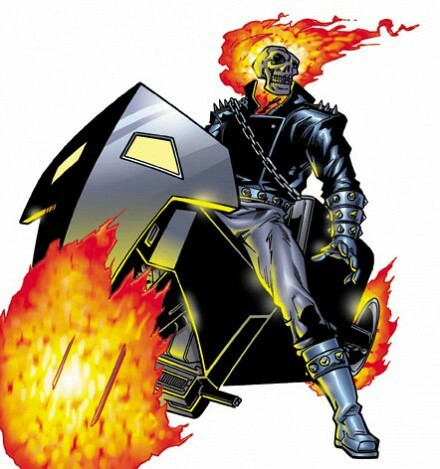 I couldn't shake that this label reminded me of something . . .
. . . Ghostrider! 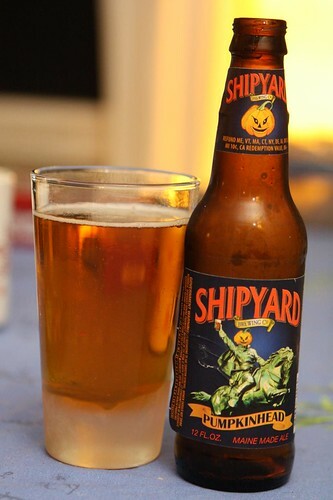 I can't wait until they make a movie about Shipyard Pumpkinhead and cast Nicholas Cage as Pumpkinhead. It's going to be totally boss. 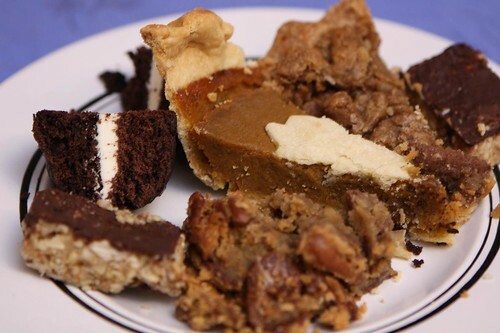 For dessert we had a medley of desserts including whoopie pies, pumpkin pie, chocolate coconut bars, pecan pie, and apple pie. To counteract the 80+ degree weather we decided to watch some Northern Exposure to watch some cooler temperatures as a way of ushering in the fall. Then we watched The Colour of Magic as a way of ushering in a mythical world balanced aback four elephants standing on the back of a giant turtle. And that, my friends, it the true meaning of Canadian Thanksgiving.